Early in the morning of April, 19, 1997, Grand Forks Herald employees were printing that day's edition in the pressroom on North Fourth Street. The headline was "Broken Dikes, Shattered Hopes". They never finished the press run. The employees evacuated as the streets filled with water. Only a few thousand papers reached the subscribers that day. Later that day, a fire started in the Security Building. The fire spread, and destroyed all the buildings on the west side of North Third Street, between First and Second Avenues. One of these was the Herald's offices, another housed the Herald's mailing service business. The building housing the presses was not damaged in the fire, but had three feet of water in it. As the floodwaters spread over the city, Herald employees abandoned their homes along with other Grand Forks residents. But the Herald published every day, and also updated their web site daily. The Herald's first temporary location was at the University of North Dakota. This location only lasted a day, until floodwaters reached the University, and the power and water supply was lost. The Herald then moved to the school in Manvel, N.Dak., about 10 miles north of Grand Forks. They prepared the stories in the school's computer lab, and transmitted them to St. Paul, Minn. for printing. The papers were flown back to Grand Forks. Newspapers were distributed free of charge in the evacuation centers. The Herald worked out of the Manvel school until the end of June, 1997. 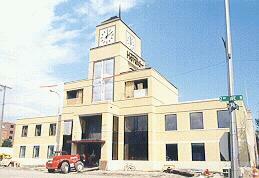 In July, 1997, the Herald returned to Grand Forks, to a vacant discount store building near the Columbia Mall. 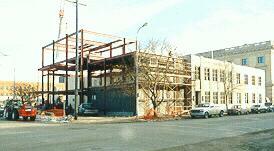 In the fall of 1997, the Herald started construction of their new building in downtown Grand Forks. 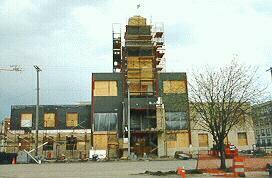 This was the first new building downtown started after the flood. The new building is at North Fourth Street and Second Avenue, next to the Herald's former pressroom, which was converted to offices. The new building has a 97 foot clock tower facing Second Avenue North. The Herald returned downtown at the end of July, 1998. The newspapers are now printed in a new building in the Grand Forks Industrial Park, an area untouched by the flood. In 1998, the Grand Forks Herald received the Pulitzer Prize for Community Service. 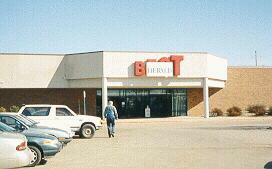 The former Best Products store was the Herald's temporary home when they returned to Grand Forks. The Herald production building in the Industrial Park, built after the flood. The new Herald building under construction, December, 1997. The new Herald building under construction, April, 1998.